The first question is to buy or make? For sale “Aknot” occur, but rarely. The quality of cheap is, frankly, leaves much to be desired, good roads and are even rarer. Personally, I prefer to do the clasp myself especially that of labor, time and materials it takes a bit, but as you can compete with the “firm”. Material for the production is stainless steel wire. 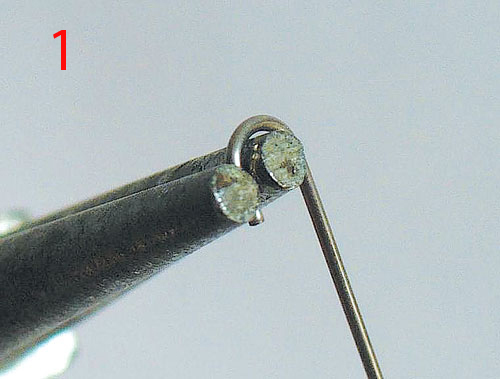 You can take the wire that are sold in fishing stores, or you can use a wire for orthodontic appliances — it is possible to get, for example, in shops “Iatrotechnics”. 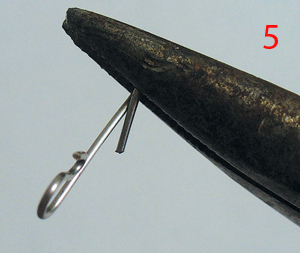 I usually use wire with a diameter of 0.5 mm, clasp from it is optimal for braided line with a breaking load of 5 — 7 kg (the sample length is 15 mm). For rough cords can be manufactured fasteners and larger. To tackle the ultra-light class use bezuslovnogo installation is not always justified, but when necessary, possessing a certain skill, you can make and microsilica wire diameter and 0.4 mm, and even thinner. Tools: palynology, pliers and wire cutters (side cutters). Pliers or the tool which you are going to bite the wire, must be sharp to less flattened wire and had no burrs. Full tool kit, of course, not mandatory, but will greatly simplify your task, and the result will please the eye. 1. First you need to make sure that the tip of the wire does not have burrs, otherwise, bites off his clippers. 2. 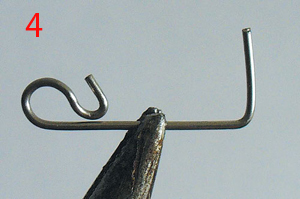 Take the tip of the wire with pliers and bend 180 degrees. 3. Intercepted the resulting bending angle (photo 1). 4. Bend in the opposite direction. 5. Bends the tip of the wire (photo 2), the final result should look like this (photo 3). 6. Turn down the free end of the wire at an angle of 90 degrees and bites off cut the required length. The approximate proportion of visible in photo 4. 7. 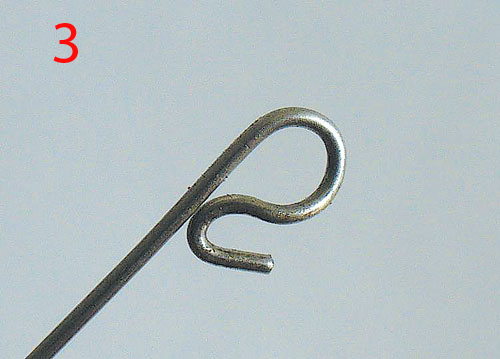 Bendable “polukruzhochkami” bent the 90 degree end so that the wire crossed at an angle of about 30 degrees, and fit snugly to each other (photo 5). This is important because there is a fixation node, preventing it from spontaneous unraveling. Clasp ready. It only remains to tie up. This puts it on a leash, fold the tip of the fishing line or braided line in half (the length of the loop approximately 3 cm). 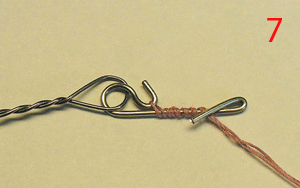 Put the loop on the bead tip to the clasp as in the photo 6, make 4 — 5 turns around the fishing line clasps. Attention! It is necessary to strictly observe the direction of winding of the fishing line: you need to wind it in the direction in which the bent locking tip of the clasp (photo 7)! 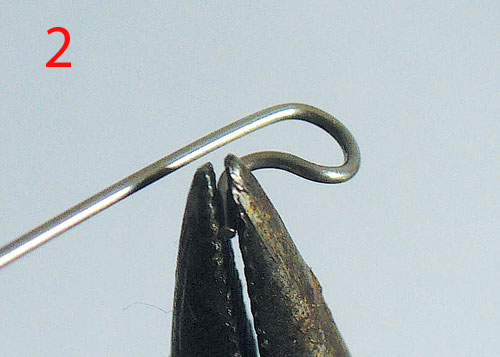 Pulling both of the tip fishing line, fix it in the loop of the clasp. That’s all, agree to bind in this way is significantly easier and faster than a normal hub! Bezuslovnoi installation has several advantages and disadvantages. The main and perhaps the only significant disadvantage is that the knot is too strong, the strength loss is only a few percent. 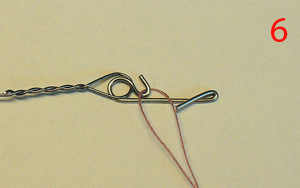 Some plaited bands, especially after prolonged use, have “weak spots”, and dead hook the braided line can break in the most unexpected place (the “Tulip”, for example, losing 30 to 40 meters of fishing line). Although such trouble to happen quite rarely, usually the cord is torn at the clasp or at the very beginning where he gets “microtrauma” as a result of contact with the bottom and aquatic vegetation. The advantages of mass. First and foremost, this is, again, strength. 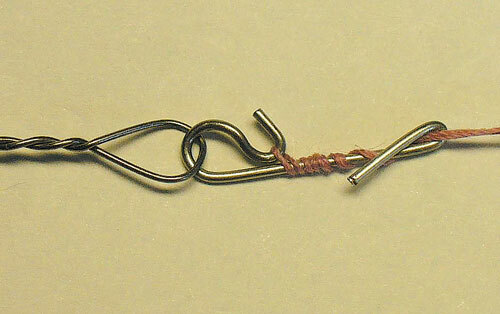 Even the tidiest node “eats” a good part of the strength of fishing line or a braided line. Second, the time required for binding is reduced to seconds, which saves precious minutes of biting and our nerves. Thirdly, the convenience and simplicity allow you to tie the buckle with frozen fingers, in low light conditions, in strong wind, even with gloves on. Should I remind you that may is the month we have once a year? That’s all, you only wish you no tail, no scales, my fellow anglers!